One of the activities of the project is to test a public service app, “FLOOD-serv App”, in order to increase the direct involvement of citizens, exploiting the collaborative power of ICT networks (networks of people, knowledge, sensors …), improve the awareness of citizens on flood risks and contribute to find solutions to mitigate collective risk. The FLOOD-serv App provides the possibility of geo-referencing, adding images, sending reports, specifying details of the messages, transfer data that will flow into the back-office platform managed by the competent authorities that will manage them and give a feedback to the users. In FLOOD-serv project there are some important testing steps for each member state of the partnership. In this context, on 12th October 2018 a workshop was held in Genoa and the title is “Flood-serv: preventing and reducing the effects of the flood”; the initiative coincided with the national “IONONRISCHIO” campaign (translation “I don’t risk”) promoted by the National Civil Protection of Italy. During the workshop there were reports/speeches on different topics, i.e., the presentation of the activities of the Flood-serv project and its progress, by Anna Colombo (Municipality of Genoa), Gerardo Brancucci (University of Genoa – DAD), Andrea Pirni (University of Genoa – DISPO); the presentation of the project “IO NON RISCHIO”, by a voluntary trainer of Civil Protection, Fabio Nardoni. 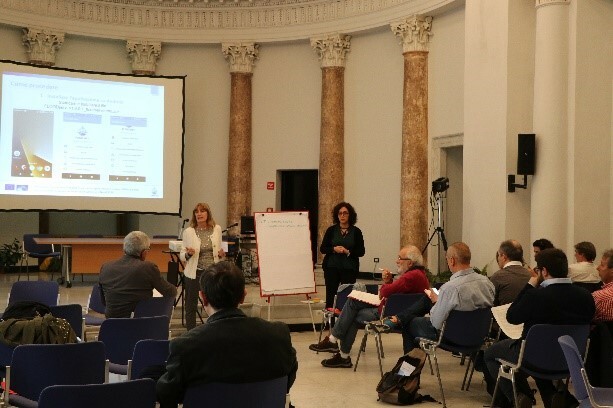 At the end of this slot, Valentina Marin (University of Genoa – DAD) and Cristina Giusso (Municipality of Genoa) described the characteristics of the tests already started in the previous months and let go to start the experimentation of the FLOOD-serv App. The participants downloaded and installed the application on their smartphone and tried to send a simple message based on the instructions received. Through the testing proposal, we intended to achieve two purposes: to spread the knowledge of the FLOOD-serv App test and, on the other hand, to collect impressions and suggestions to improve this tool. In the second slot, a workshop Franca Balletti (University of Genoa – DAD) and Daniela Rimondi (University of Genoa – DAD) held and conducted another slot. It was aimed to a comparison among the participants and the speakers and to collect and share suggestions and indications about the use of ICT in the dialogue between citizens and public institutions. We proposed two distinct moments of discussion about different identified themes, both organized according to the brainstorming technique. The method proved was suitable for developing the discussion and allowed the collection of many operative indications and original “food for thought”. It’s important to remember that the participants at the workshop were qualified stakeholders, as representative of institutional or associations, operators that work for Public Authorities and know in depth both the problems related to the floods and the problems and the opportunities of dialogue through ICT between PA and citizens. In particular, there were representatives of: city associations that carry out activities on the territory; local department of municipal institutions (competent offices on territorial issues and hydrogeological risk); Fire Brigade and Municipal Police; professional orders and professional associations. The methods for collecting information from citizens towards public administration. With regard to the REPORT PROCESS, it was necessary to strengthen the tools for communication and for exchange of knowledge on the territory, as well as to simplify in reading and interpreting the reports. The reporting process should interact with the preliminary procedure that starts up in the resolution of a problem identified and taken care of. Another widely discussed topic was the AUTHENTICITY OF THE SIGNALS. It should be essential that every communication system through ICT was equipped with adequate tools to distinguish and evaluate reports, in order to identify and interpret them even in the context of the “background noise” of the ICT and social network. In addition, indications regarding the INTERNET INSTITUTIONAL WEBSITES AND THEIR LANGUAGE have emerged: the need to improve both the graphics and the organization of the institutional internet sites was discussed, in order to make them easier to use, finding the right compromise between a technical language and a language that, although simplified, is formally correct and effective. It was also highlighted the need to USE MULTIPLE INTERACTIVE INSTRUMENTS or, if the goal of communication is the transparency and the speed of “delivery” the messages, many different channels should be provided to reach a multiplicity of users (including human contact). In this sense, the use of existing social media could be done by certifying the authenticity. This process can facilitate reporting and decrease the work related to individual feedback (if the site I’m viewing is certified I can stick to what I read there without necessarily doing verification reports / calls / etc.). New and important objectives have been suggested to the Administrations: increasing the CULTURE OF PREVENTION AND SELF-PROTECTION of individual citizens and the community as a whole, preparing and activating communication campaigns capable of increasing individual and community skills, verifying the result. To increase the CAPACITY OF THE USE OF INSTITUTIONAL SITES AND SOCIAL MEDIA, or to set up and activate communication campaigns able to improve individual IT skills and cultural competences in order to distinguish reliable sites from those that are not and to spread the aptitude to respect the ethical and civil rules on social media. Other suggestion to the PA is about spreading the CULTURE OF CIVIL PROTECTION, or teach citizens to “be unprepared” (an expression suggested by one of the participants) in the awareness that, we can face the crises that may arise, only being ready and organized.